\"In 2019 we also celebrate 50 years since brave young pilots flew one quarter of one million miles through space to plant an American flag on the face of the Moon. 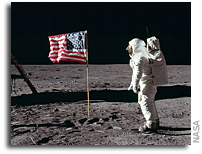 Half a century later, we are joined by one of the Apollo 11 astronauts who planted that flag, Buzz Aldrin. Thank you, Buzz. This year, American astronauts will go back to space in American rockets.\"
This page contains a single entry by Keith Cowing published on February 5, 2019 9:04 PM. A Reminder From China About Space Station Lifespans was the previous entry in this blog. Commercial Crew Dates Slip Yet Again is the next entry in this blog.